The term anaerobic digestion usually refers to the microbial conversion of organic material to biogas, which mainly consists of methane and carbon dioxide. The technical application of the naturally-occurring process is used to provide a renewable energy carrier and – as the substrate is often waste material – to reduce the organic matter content of the substrate prior to disposal. Applications can be found in sewage sludge treatment, the treatment of industrial and municipal solid wastes and wastewaters (including landfill gas utilization), and the conversion of agricultural residues and energy crops. 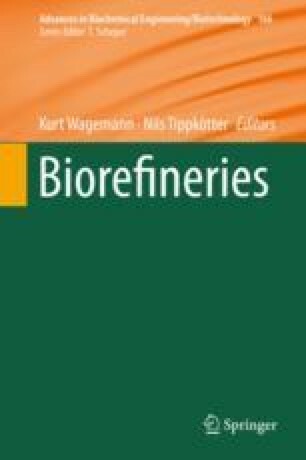 For biorefinery concepts, the anaerobic digestion (AD) process is, on the one hand, an option to treat organic residues from other production processes. Concomitant effects are the reduction of organic carbon within the treated substance, the conversion of nitrogen and sulfur components, and the production of an energy-rich gas – the biogas. On the other hand, the multistep conversion of complex organic material offers the possibility of interrupting the conversion chain and locking out intermediates for utilization as basic material within the chemical industry.